Candice's Beauty Blog! : Blogging "Low".. Sorry dear readers.. You can see that I've been on a blogging low lately but please don't unsubscribe to me for that. I plan on continuing with unboxings and reviews and chit-chat but it hasn't been happening lately. I've been so busy and stressed out and worried and exhausted... Every night I dream of falling asleep. It's this dream where I'm trying to find a bed because I'm so exhausted, I need to sleep but I can't. I'm supposed to be sleeping during this time because I'm dreaming, but I'm pretty sure I'm not really sleeping so much. Anyway, it makes for a pretty exhausted mommy of two working full time and I don't have the motivation to blog with everything else going on like my relationship crumbling. Overall though things are OK. It's not amazing but I'm hopeful and in no way suffering from depression or anxiety or any of these things that really feel horrible and make life so hard. Life is good to me. I got the Benefit Topbox and was so happy to try all the products! I never tried anything from them before and I really like everything that was included a whole lot so it was a really super discovery for me! The other subscription is Ipsy and though February was a bit sucky with another primer, another mascara, stupid lash cards with a liner I have no brush for, I did like the Coastal Scents shadows a lot and watching Michelle Phan's video tutorial made something "click" for me when it comes to applying eyeshadow and I seriously feel like I've progressed A LOT since the last picture I posted. Hopefully more to come on that level in the near future. I've been wanting to give a tiny update about TNBB. My feelings about them have not changed at all, but I wanted to still be honest about the positive experience I had with their facial gelee. A really interesting product that smells like vanilla and feels nice on the skin. I also liked their pina colada shower gel for how it left my skin (clean but also moisturized). In the past few days I made a couple purchases. I'm really excited! At Walmart I saw a kit for Taylor Swift Wonderstruck mini bottle (15ml) with a mini lotion and mini shower gel (50ml each) for 7$ instead of 29$. I had smelled and liked it so I went ahead and got it. Turns out it smells a bit weird on me so it's not 100% winning as far as purchases go but I can't help but be thrilled because I love the little bottle and I still like how it smells generally. I saw the brush set a couple days before and it seemed to be good quality-price wise, with good reviews and decent price (30$ down from 45$). But the shipping to Canada is 15$ and we also get charged 5$ by UPS or Fedex or whoever PLUS the provincial and federal taxes (15% for me here)! So that plan went out the window and I continued looking for makeup brush alternatives including just getting the very basic 2-3 brushes I wanted in higher end price range. Then yesterday I saw that they were having a 50% SALE (still on!!) which meant that my brushes would be 15$, or 30$ with shipping, with NO extra fees or taxes because it's under 20$ excluding shipping! I jumped on it! Since I started using the Josie Maran argan oil from IPSY, I've been looking for a product to replace it once it's gone. I don't want to spend 60$ on oil especially when it's one single ingredient... I found out that Julep has one for 24$. 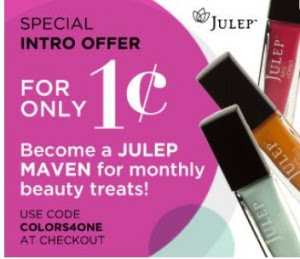 I've never purchased anything full price from Julep before, but their oil was still a lot less expensive than the Josie Maran and I always love Julep so I decided I'd go for it. In the next days there was a promotion for 25$ for a 50$ gift card! Knowing I'd be spending 24$ anyway, I went for it! And I decided to wait until the monthly box came out because I know they have a secret store for Mavens who order the box and I'd prefer using the other 26$ of my gift card on things that were a good deal than for something like 2 full price polishes. I ended up liking the box and using my remaining Jules for a box and an add-on (so FREE), and getting into the secret store this morning. OMG, the argan oil was IN THE SECRET STORE, ON SPECIAL! So I got 2 of those, 1 trio (Gold Rush) and a pack of nail polish removing wipes for my 25$ gift card (came up to 49.96$). Thanks for getting to the end anyone. Please stick around. Hopefully some less "texty" and more visual posts to come in the future. I will aim for better quality! Glad you're back! :) I was wondering where Candace was! I am sad to hear about your relationship, I hope things work themselves out for the good. Times like this can be very stressful. I went thru that last year. Combine that with a hectic schedule can make anyone want to just curl up in ball. Stay strong Candace and don't worry we will still be here for you! It is so good to see you back.Don't worry life has its ups and downs.Sometimes you feel like things r never going to improve but then suddenly life takes a turn and everything becomes cheerful and bright.Busy schedule and kids can make a relationship suffer very badly.In such cases circumstances are more to be blamed then people.And circumstances change so buck up.I wish and pray that may you stay happy and smiling.Just keep praying and keep going on.Things will get better.They always do :) lots of hugs and prays. Oh Candace, I am so sad to hear about your relationship...marriage isn't easy and when I didn't see you blog for awhile, I had you and your family in my prayers. I can't imagine what you must be going through, but take care of yourself and your family and like Teresa said, we'll be here for you whenever you're ready. i hope everything works out for you soon Candice! and that you can finally get some sleep! Awee would never think of unsubscribing! Hope all works out for you and things start picking up! I know how you feel I have hit that low a bit too. Thanks you guys, you're so sweet. I'm feeling much better these days... Things have calmed down at home and I started jogging which feels great. ME TIME away from the stresses of life. Sleeping better too. Thanks for the support.